Cranberry bliss bars don’t ring any bells in my head. I’m sure I’ve seen it in the Starbucks pastry cases before, but I doubt I’ve ever tasted one. I tend to head for the lemon pound cake and the scones and the coffee cakes. But this sounded good. Way too good to not make. I made a batch for Mom’s party tonight, and for Dad to take to work tomorrow. Though Dad gave me creative license (Yay! No more sugar/chocolate chip cookies! No more boring stuff that I don’t really want to make! ), I still toned it down a bit. I substituted chopped, toasted walnuts inside the bars. I used heaping 1/4 cupfuls of nuts and cranberries, as it seemed like 1/4 cup was barely anything, and you can’t have a cranberry bliss bar with a speck of cranberries. I didn’t have any nutmeg, so I used about 1/2 tsp cinnamon and 1/4 tsp cloves instead. I also had caramelized white chocolate on hand that I had no idea what to do with, so I decided to use 1/4 cup of that. It kind of seized and was crumbly, so I didn’t chop it. 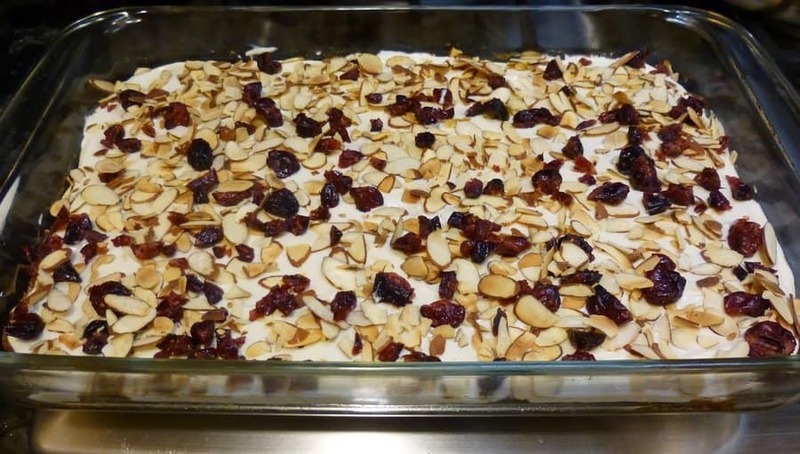 Making these cranberry bliss bars was pretty easy and straightforward. The most annoying part was creaming the butter and sugar, since it took at least 90 minutes for the butter to soften. It’s freezing in the house, and I finally turned on the heater so that the butter would warm up faster. I don’t turn on the heater for myself, I turn it on for the butter. I’ve accepted that my priorities are weird. My eggs were super cold, so they seized on contact with the butter and sugar. Whoops. I think this separation is why butter was bubbling on the top of the bars. I baked it for 3 more minutes in hopes of the bubbles subsiding. They didn’t, but the bars were brown, so I pulled them. I added toasted sliced almonds on top along with the cranberries. I used the zest of a lemon in the frosting; measuring zest is for chumps. The shortbread was okay, nothing too memorable. I think they were a bit overbaked. However, the edges were like the best toffee you’ve ever had. They were a bit crunchy and sweet and buttery, probably due to those butter bubbles. Mmmm. The frosting was what made them, in my opinion; though, quick disclaimer: I’m a sucker for any cream cheese frosting. The cream cheese and lemon popped. The cranberries on top re-enforced the cranberry-ness. Despite no knowledge of how homemade cranberry bliss bars compare to the Starbucks ones, I think mine are pretty good. I love how festive they are with the ruby berries. Some chopped mint or green sprinkles or green marzipan leaves over the top would make it even more Christmas-y. And why wouldn’t you want it to be more Christmas-y? Bethany Mota decorated for Christmas as soon as her fall decorations came down. If you think about it, I’m actually pretty late on the bandwagon. Which is exactly why I think need to up my Christmas spirit and make these again soon. Cream butter and sugar; add the vanilla and eggs, one at a time, stirring well after each addition. Sift dry ingredients. Add to the wets, beating until fully incorporated. It will be very thick. Fold in the cranberries, chocolate and ginger. Spread in a greased 9×13 pan and bake at 350F for 30 minutes or until light golden. Cool before frosting. Beat the butter and cream cheese until fluffy; add the zest, vanilla and a pinch of salt; add the sugar bit by bit until the frosting has reached your desired consistency (you may use less than 1 1/2 cups). Frost the cake and scatter the cranberries on top immediately. Slice the bars into rectangles, then triangles.